I posted a short comment about the issue of "Earth Changes" recently and decide to provide more details, plus Internet resources, so people could do their own monitoring and research on the subject. Sun induced climate change is now occurring and will create huge planetary changes in the coming decades. There have been a large number of scientific papers presented on this subject. The evidence is that this will overwhelm the CO2 climate change warming narrative. This event will create a lot of instability on our planet. The Sun is going into one of it's quiet periods. The historic records show the Sun goes into a Maunder type Minimum approximately every four hundred years. We are due for one, and there have been a lot of research paper releases recently that are pointing to us entering the beginning of one of these events. Historic records show that when a solar events like this occurs it results in dramatic worldwide weather changes, more political upheaval, empires die, more wars occur, plus there are large worldwide crop failures. What this means is that the Sun is becoming far less radiant. A less Sun radiance means it’s heliosphere becomes much weaker. The heliosphere is a bubble-like region of space dominated by the Sun’s solar wind and magnetic field. It normally extends far beyond the orbit of Pluto. Plasma "blown" out from the sun's heliosphere acts as a shield, protecting the solar system and Earth from in coming intergalactic and galactic cosmic rays. A much weaker heliosphere means more cosmic rays strike earth’s upper atmosphere. The comic ray intensity will also increase because the Earth is moving out of the local cloud, which is the left over remnant of an old supernova event. The local cloud has also been providing some protection from galactic cosmic rays. 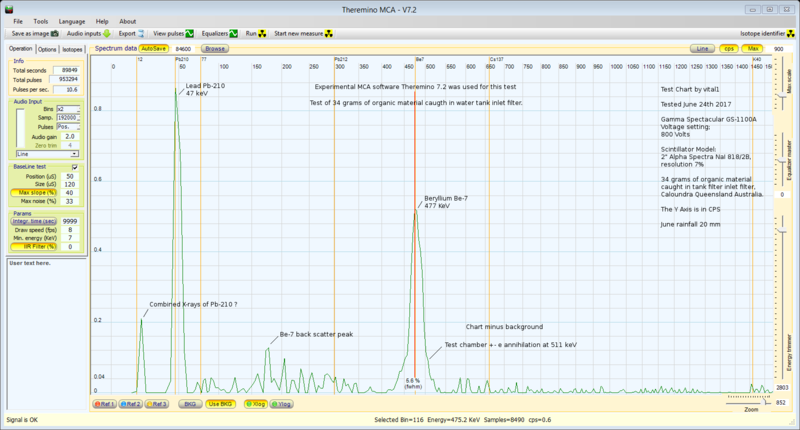 I have very sophisticated computer based radiation testing equipment, and a recent test of 34 grams of organic material caught in a local water tank inlet filter, resulted in the detection of a lot of isotope Beryllium-7 (Be-7). This test indicates that a lot more cosmic rays are striking the upper atmosphere. The amount of Be-7 increases as more cosmic rays strike the upper atmosphere. It takes around two weeks for upper atmosphere Be-7 to work its way down to the surface. Be-7 can be created naturally in trace amounts by spallation in the upper atmosphere by cosmic rays. Lead Pb-210 is the decay daughter of naturally occurring Radon-222 decay. The fact is, this is a lot of Be-7 in a small 34 grams of material. A contact found this research paper, and sent it to me. It shows that Be-7 production is tied to Solar cycles. As the sun heliosphere diminishes, more Be-7 is produced in the upper atmosphere. When we go into one of these quiet Sun periods the historic records show there is a significant up tick in earthquake and volcanic eruptions. The volcanic eruptions will release huge amounts of sulfur dioxide and particulate matter into the atmosphere, which will cause global cooling and significant weather changes. I have set up a local live Radon monitoring station which has been operating here for years now. Towards the end of last year, and leading into this year, I have been getting these very large Radon spike detections at the local live Radon monitoring station, when the wind comes from the Pacific rim. These detections point to a significant up tick in volcanic and earthquake activity on the Pacific fault lines. I have been a sun watcher for many years, and know it was very unusual for the small solar storms that occurred in 2011 to produce Northern light displays, so far south in North America at the time. These unusual Northern lights displays indicated to me that the electrical dynamics of the upper atmosphere had been changed. In my opinion the Fukushima Nuclear Catastrophe was responsible for this upper atmosphere damage. Huge amounts of Ionizing radiation released, and still being released from the Fukushima site, has significantly changed the electrical proprieties of the upper atmosphere. This has significantly altered the way solar wind energy is now distributed through earth's atmosphere. Added to this, the earth's magnetic field has weakened by 20% already, and appears to be weakening by around 10% per decade, plus this weakening may accelerate in the coming years. What would have been considered relatively weak solar storms previously, are now causing more electrical equipment failure, and transformer fires around the world. The combined effect of a weaker magnetic field, and the atmospheric ionizing radiation damage now means that a much much smaller solar event, one significantly smaller than a “Carrington Event of 1859”, could wipe out large parts of earth’s electrical infrastructure! If you are smart you will study the subject. With this knowledge you will make better decisions. You will become more aware of the new risks in the changing environment and take due care. With the increasing cosmic ray exposure and a weaker magnetosphere, air crew and passengers will be exposed to lot more radiation exposure on long hall flights! In this new environment, would it be wise to take a new born baby on a long plane trip to visit the grandparents in England? There is now much more risk for that child because they will be exposed to significantly more intense cosmic rays for many hours while on this high altitude flight there and back. There will be extreme weather events. It will not just be heat records broken, but also extreme cold events. It will result in more severe storms, hail storms and lighting strikes, severe flooding, and record snow, as climate regions shift. UV levels are already extreme here in summer, so the last thing you want to be doing is going to a lovely sandy beach with your family in the middle of the day in summer. If you are out and about in these extreme UV conditions, you should also be wearing, a wide brim hat, proper clothing, plus good quality wrap around UV rated sun glasses. If you don’t, you are more likely to develop skin cancers and eye cataracts. These events are already occurring, and if you take the time to the research the subject, you will find numerous reports on the Internet. It is officially recognized that the world is in a more dangerous situation now than during the cold war! World natural resources and food supplies will come under severe pressure, as a result of large crop failures and natural disasters. We have numerous nuclear plants around the world. These plants could become ticking time bombs in severe weather conditions and with increased volcanic and earthquake activity. I know that there is a lie being spread on the Internet that no one has died as a result of the ongoing Fukushima Nuclear Catastrophe. Here is proof that it is a lie. If a nuclear event or war broke out what would you do? It is no use waiting till the last minute to find out what you need to do to increase your family's chance of survival. Numerous countries around the world have recently been instigating civil defense education programs. Nuclear war or a nuclear accident are survivable if you have prepared and have researched the subject and know what to do to protect your family. All these changes will mean you will have to be on your toes and have some preparations in place. Modern society works on a system of delivery on time. This means there are no large stores of food items at the local supermarkets, plus if the local power goes down for any length of time, the water supply will stop. A freezing cold event can also take out the water supply as the water pipes burst from expanding ice as they freeze. Sweden, Estonia, and other countries recently told their citizens to have extra food and water on hand in case of war or disaster. Some are recommending a week to a month or more extra. Here are some video instructions they provided. They also pointed out that their citizens will not be able to rely on their governments for help if a major event occurs. Other countries have provided similar advice. Here are links to lots of useful Internet services that will allow you to monitor environmental conditions, plus provide you with information on preparations you should consider putting in place. Suggested sites and resources to add to this list are welcome. It is important to learn how these environmental monitoring sites work. They all have different site navigation systems, charting and measurement types. In an emergency you may not have time to work out how to find the relevant data you need, or what a particular environmental measurement means. Having some prior knowledge on how to navigate each site, plus what the levels mean, could be a life saver. Emergencies can happen at any time. This RediPlan is a free disaster preparedness guide that will get you prepared for any emergency in four simple steps. Electroverse is an excellent site for the finding the latest Earth Changes reports, on Extreme Weather Events, Crop Losses, Increasing Comic Rays, Volcanic and Seismic events. This site has and extensive list of scientific data sheets that show you what is really happening around the planet. Nullschool 3D world Map, this service allows you to see location wind direction at different heights. You can rotate the 3D map by holding down your mouse on the map, and dragging. If you use your mouse's scroll wheel, you can zoom the map in and out. If you click on the "Earth" item at the lower left corner of the Nullschool wind map page, a menu will pop up, that allows you to select the wind height. Windy.com, another world wide weather service that is easy to use. Scroll down the page for an interactive map to search by state and location. CafeRadLab Free Guides and Resources For Everyone Here! Get Prepared For Earth Changes! The purpose of life is to learn to express your personal energy Creatively and Lovingly! Worldwide crop losses have increased dramatically in the last six months. If this trend continues into 2019 we will see further dramatic increase in food prices around the world. The food shortages could lead to a lot of social unrest in the most affected countries. 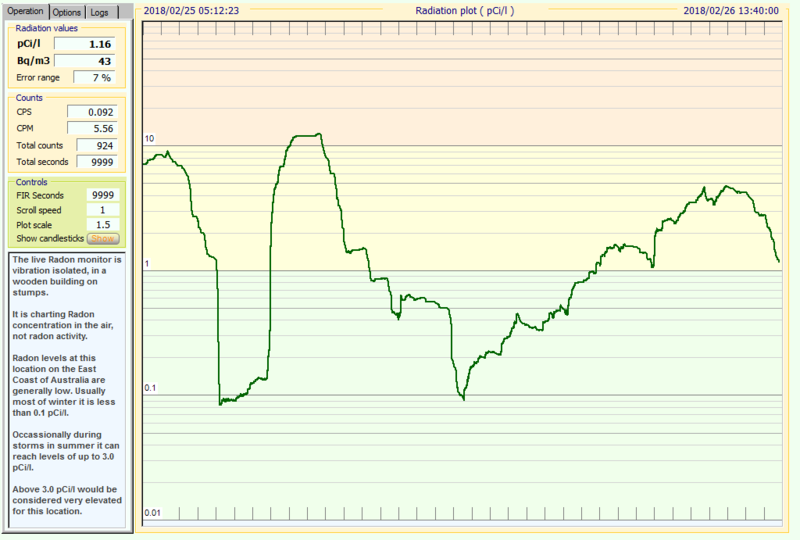 As the Sun goes quiet during this cycle, its Total Solar Irradiance (TSI) is deminishing. Because of this Galactic and Inter Galactic Cosmic rays penetration into earth's atmosphere has hit an historic high level, and is increasing. The cosmic ray increase will create a lot of dramatic Earth Changes. Read the "Earth Changes" article above and do further research on the subject. "Excellent time to become proficient in growing microgreens and fermenting foods..."
I think it would be a good idea to get the whole family geared up to grow some food, microgreens are an easy way to start. Also look a ways to significantly cut household living expenses now, as food prices increase people who are not prepared will be in financial shock. Get as many people as possible around you prepared for the earth changes that are occurring. These earth changes are already happening right now, we are at the beginning of the cycle, and as the Sun goes quieter the earth changes will intensify. Suggesting microgreens specifically because they are 1. super easy to grow, 2. don't require extensive 'infrastructure' (grow them in a well-lit room, say under a skylight), and 3. are nutrient dense; fermenting food because of the enhanced nutritional values and long shelf life. My experience in Uruguay and from watching weather extremes in other regions is that the long-lasting and punishing rains, the cyclonic winds, and the damaging hail stones are going to make traditional agriculture near to impossible to sustain. Food forests with protective canopies, perennial fruit, vegetable and herbaceous producers will be better able to survive the extremes than the usual vegetable garden will. Indoor growing supported by solar, wind and tidal powered lighting is another viable option. I've got a good start on my food forest with fruit trees, perennial greens and herbs planted amongst swales. I follow a few permaculture and homestead folks in youtube and that's a growing movement... no pun intended. Curtis Stone offers technical details on a variety of urban farm methods that people can profit from as well as sustain themselves https://www.youtube.com/user/urbanfarmercstone/videos. John Kohler also produces urban farm information for urban growers https://www.youtube.com/user/growingyourgreens/videos. And, Doug and Stacy have built an incredibly productive landscape (currently building a modern-styled 'root cellar') https://www.youtube.com/user/growinginfaithfarm/videos. Those are the three 'best' food production educators I've seen, though there are others showcasing their food projects. Down under is Self Sufficient Me https://www.youtube.com/user/markyv69/videos and in Scandinavia is Swedish Homestead https://www.youtube.com/channel/UC7GkLSN...-Fg/videos. They are all good suggestions, all those youtubes channels have a wealth of information on growing food. Rain water harvesting is also and important area to research. You're right, I forget about rainwater as an issue because we've been getting so much here. I've prepared the foundation for a small holding pond and need to get rain gutters under my roof edge to draft water to the pond and perhaps a tank, if my money issues get better. 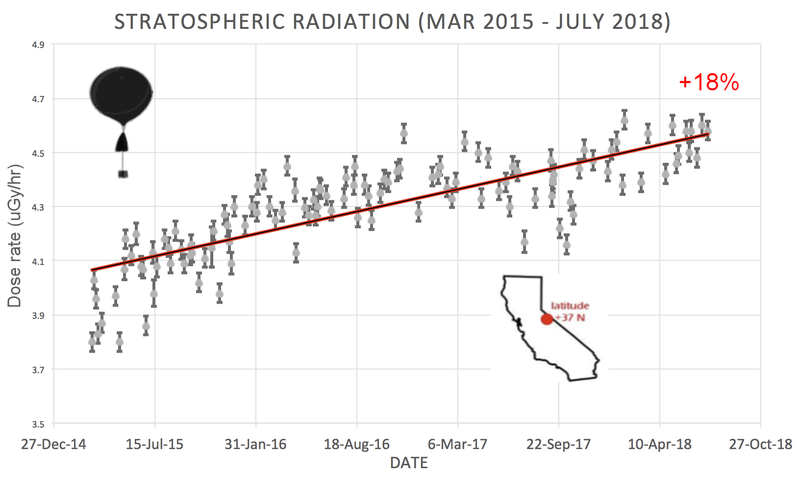 High altitude balloon tests of cosmic rays levels from 2015 to 2018 are showing levels hitting historic highs! Cosmic ray increases histrionically create significant earth changes. If you are new here and don't no why this is so important read the main article above, and do further research on the subject. During a Grand Solar Minima the upper atmosphere becomes more charged from very high energy galactic and intergalactic cosmic particles hitting the earth's upper atmosphere. In this high altitude balloon testing chart from spaceweather.com, you can see that cosmic ray intensity has hit historic high levels in 2018. One of the effects of increased cosmic rays is the upper atmosphere high speed jet streams at the North and South Poles start to wander more frequently from their normal relatively stable course. As the Northern Hemisphere jet stream wanders South, it draws cold Arctic air with it, and on the other side of this much warmer tropical air can be drawn from the tropics much further North. In this image you can see what a stable jet stream looks like compared to a polar vortex event. During a polar vortex event, a country as large as the US could have part of the country experiencing a heat wave, while the other part will be experiencing record cold temperatures. This image shows how a solar vortex can create enormous temperature differences. Where the very hot and very cold air masses meet, you will see extreme weather events occur. Grand Solar Minima are historically associated with dramatic weather events. Examples are massive hail events, a year or month's worth of rain falling in a day, record snow, record hot and cold temperatures, plus way above the normal number of lightning strikes during storms. Tornadoes can appear in regions where you would not expect to see them. Deserts can see massive flooding or even snow, while other areas that are normally wet can experience droughts. These earth changes happen so quickly and dramatically that farmers can't cope. This leads to massive crop losses, as we can see presently occurring on the worldwide crop loss map below. Click the map markers to get report details. These worldwide crop losses have been created by rapid and dynamically changing weather conditions, cold, heat, flooding, snow, hail and drought etc., over the last 12 months. As we go deeper into a Grand Solar Minima, crop losses will intensify, because of an increasing number of volcanic eruptions and earthquakes that are also triggered by the increasing cosmic rays intensity. There is a lot of scientific discussion at present on how extreme this Grand Solar Minima will be. Will it be similar to a milder Dalton, (years 1790 1820), or more like the extreme Maunder Minima (years 1645 1715). There is the possibility that this Grand Solar Minima will be even more extreme than both of these recent past Grand Solar Minima. The strength or weakness of the next eleven year solar cycle will provide an indication. The number of Sun spots define what is a minimum or maximum for a solar cycle. Most governments are not up to speed on this new dynamic, and this will lead to a lot of people dying and worldwide instability because there have not been significant preparations put in place. We know what happened in the past during Grand Solar Minima. It is all there in plain sight in the historical record for anyone who takes the time to do some basic research on the subject. Electroverse (Link Below), is an excellent site for the finding the latest Earth Changes reports, on Extreme Weather Events, Crop Losses, Increasing Comic Rays, Volcanic and Seismic events. This site has and extensive list of scientific data sheets that show you what is really happening around the planet. Most of you would be surprised to know that you have two washing machines in your house. The cloths washing machine, and the other is the big flat TV screen used for brain washing. If you rely on on your big flat screen TV brain washing machine for facts you will be blindsided by what is happening to our planet. You need to do research outside of the main stream media narratives if you have any chance of being prepared for what is coming. The worst flooding disaster in the history of the Midwest is just getting started, and as this crisis unfolds we are all going to be feeling the pain. The “bomb cyclone” that recently brought hurricane-force winds and blizzard conditions to the middle of the nation was the spark that set off this catastrophic flooding, and now all of the snow from one of the snowiest winters in decades is going to be feeding into rivers that have already shattered all-time flood records. As you will see below, most of the Great Plains and Upper Midwest is currently covered by more than 10 inches of snow, and all of that water has to go somewhere. As all of that snow melts, we are going to witness an agricultural disaster that is far beyond anything that we have ever seen before in modern American history. At this moment, millions of acres of farmland are underwater, and that is not going to change any time soon. When the flood waters came, they moved so rapidly that they literally picked up pigs and baby calves and carried them along. Roads, rail lines and entire small towns have been washed away, and so even if farmers had something left to sell they couldn’t get it to market anyway. “When you’re losing money to start with, how do you take on extra losses?” asked Clint Pischel, 23, of Niobrara, Neb., whose lowland fields were flooded by the ice-filled Niobrara River after a dam failed. He spent Monday gathering 30 dead baby calves from his family’s ranch in this northern region of the state, finding their bodies under huge chunks of ice. Large numbers of farmers around the World are under enormous financial strain because of massive crop losses created by dramatic weather events. Catastrophic events like this are happening all around the world. As food prices increase people will change their spending habits and focus more on necessities. This process will affect the World economy.